In a saucepan, melt butter and sauté peppers. Whisk in the flour. Add milk and salt. Stir until blended and beginning to thicken, about 10-minutes. Turn off heat. Allow to cool a little before adding egg. Stir in egg yolk, and remaining ingredients. Add crab meat last: gently stirring so not to break up lumps of crab meat. 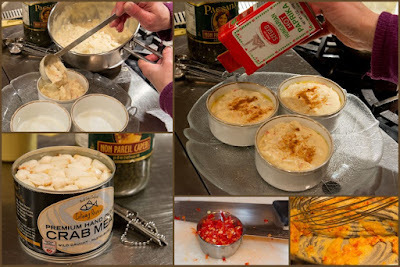 Spoon into ramekins (shallow individual baking dishes). Sprinkle with paprika and bake 30 minutes or until golden brown on top. For a balanced meal; serve with a starch and vegetable. We served ours with sweet potato oven baked fries and a side of sautéed Zucchini and Onions. Recipe and blog post Copyright (C)Wind. All rights reserved. Recipe inspired by The Williamsburg Cookbook, "Hampton Crab Imperial".